Inspired by the cosmic adventures of Wiltshire astronaut Tim Peake, Morph is making his own journey into Space today (6 July). As astronaut Tim Peake will be making the return journey to Earth this weekend, we've been remembering is best moments in space. The Wiltshire astronaut is set to return to earth after months on board the International Space Station. Youngsters at a school in Devon have enjoyed a memorable day in the classroom thanks to a lesson from the British astronaut Tim Peake. They managed to establish radio links with Tim. 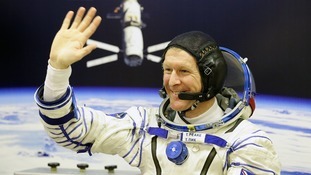 The astronaut, from Wiltshire, has been on in the International Space Station for nearly five months. Local primary schools, Exeter University and Goonhilly Earth station also joined the conversation. It gave the children the chance to talk to the former Yeovil-based helicopter pilot about his life on the ISS. The Wiltshire astronaut made a surprise 'appearance' at The Brit Awards, announcing the global success category. Beware the Ape in Space! It is not every day that you get chased by a gorilla in space. You'd have thought it more likely for aliens to be pursuing you. But that is exactly what happened to Wiltshire astronaut Major Tim Peake on the International Space Station. In fact, it was Tim Peake's American colleague, Nasa astronaut Scott Kelly, celebrating the end of his year in space with the help of a gorilla suit given to him by his twin brother Mark. Students at the Oasis Academy Brightstowe in Bristol will get the chance to talk directly to British astronaut Tim Peake later. 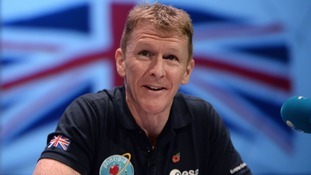 Wiltshire astronaut Tim Peake will be taking questions from schoolchildren from around the country at 2pm this afternoon (2 February). The Cosmic Classroom live event will see young people get the chance to put their questions to the former army pilot who's currently on board the International Space Station, more than 400km above the surface of the earth. Pupils from 11 schools will be in the audience at the World Museum in Liverpool, but schools all over the country will also be joining in by live streaming in their own classrooms. He may be 400km away, but that didn't stop astronaut Tim Peake enjoying a proper english breakfast on board the International Space Station.